As much as I love caramel, i don’t think i’ve ever really had something i’d use as a rubric from which to measure all other caramels against (an Ultimate Caramel if you will) like i do with English Toffee, but i’m still looking. Last week I attempted to create it by combining 3 cups Dairy Queen Caramel Heath Blizzard with 6 ounces of regular (or your favorite) piping-hot coffee. Stir vigorously. It was amazing, but didn’t exactly have the desired effect (possibly because I’m not a coffee drinker). 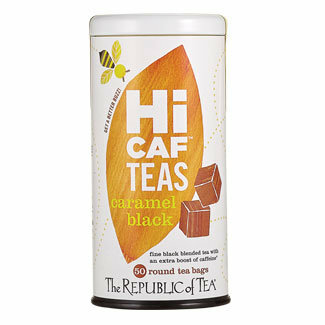 Today I’m crossing my fingers that Republic of Tea‘s HiCaf Caramel Black will do the trick. The scent is utterly caramel. I think i smell some black tea in there somewhere, but it could be my imagination. The taste however is a wonderful blend of both Darjeeling and caramel, to the point where i can’t really tell where one ends and the other begins. To drink it’s a wonderfully calming experience–a complete success. From its scent and the advertising one would be apt to think the tea would be honeyed, and it isn’t (thank you! We hate honeyed tea). Caramel Black is made from Black tea, Green tea extract and natural caramel flavor. I guess in reflection you can’t really have caramel without sugar, so i think Caramel Black will have to settle for the label “Best Diet Caramel”. I’ve long been a fan of Republic of Tea and probably would place them in my top five favorite mainstream vendors. Caramel Black normally retails for $13 but i was able to snag mine on clearance at Plum Market for $6.50. Since i’m sensitive to caffeine, this is the first time I’ve tried Republic’s HiCaf line. Thankfully, it’s not overpowering so I call it a win. A great choice for non-coffee drinkers!